Today on #ThatBusinessShow with Jamie Meloni; available every weekday at 8am on 1250whnz or http://www.tampabayradio.com – we had two wonderful guests. Co hosting today alongside me was the lovely Stella Guidicelli First we had Joryn Jenkins, CEO of Open Palm Law, a different kind of law firm, practicing collaborative law. 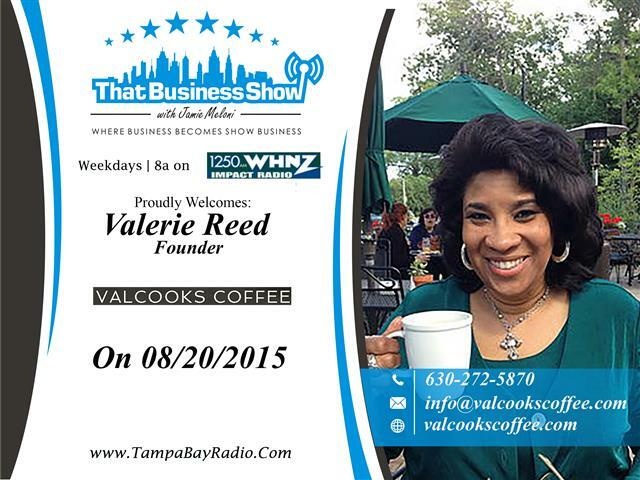 On the second segment, we had coffee connoisseur, entrepreneur, restaurateur, and future published author Valerie Reed. Our two guests today made quite the show. Remember, #ThatBusinessShow is live every weekday on 1250whnz, and is available on http://www.tampabayradio.com or watch the video of the show at my YouTube channel at http://www.youtube.com/jamiemeloni. On our first segment, we had the CEO of Open Palm Law, Joryn Jenkins. Joryn Jenkins is a trial attorney with 35 years of courtroom experience, now in private practice at Open Palm Law in Tampa, where she concentrates on the collaborative practice of family law. She is the author of Florida Civil Practice Motions, and more recently, The Stepmother’s Cookbook, War or Peace, Avoid the Destruction of Divorce Court and I Never Saw My Father Again, The Divorce Court Effect, available on Amazon.com, or at http://www.openpalmlaw.com. Joryn has a passion for keeping families happy, as she described collaborative law to us. She prides Open Palm Law on its differences to other firms and its usage of collaborative law to keep divorces less destructive and more constructive. Her way of collaborative law is a very interesting and new way to make many processes – not just divorce – easier and with less hassle and debate. You can find out more about Joryn and Open Palm Law at http://www.openpalmlaw.com or reach her personally at joryn@jorynjenkinslaw.com or at 813-334-9606. Thank you for tuning into #ThatBusinessShow with me, Jamie Meloni. As always, the show is on every weekday at 8am on 1250whnz, or on http://www.tampabayradio.com. Make sure to tune in! Also, the live footage can be found on http://www.youtube.com/jamie meloni.com. This entry was posted in Entrepreneurship and Business and tagged business, coffee, collaborative law, entrepreneur, show business, tenant law. Bookmark the permalink.